It has been so fun watching these boy’s grow up together! They are as close as brothers and are hilarious to watch. When we started Lulu and Roo I was pregnant with Knox and Liam was just a few months old. They have literally spent almost everyday together since they were born. We have help watching the boys and feel so lucky they can spend so much time together, our older kids ( age 5 and 7) are also best friends. Being boys, they can get quite dirty so at times so we throw them in the bath together. Our kids love taking baths (especially when squirt guns are involved)! We were recently introduced to Tubby Todd bath products which we LOVE! Their products are hypoallergenic and safe for sensitive skin (very important to us because my kids have very delicate skin). I also love how much it lathers with very little product, their products last us a looong time! 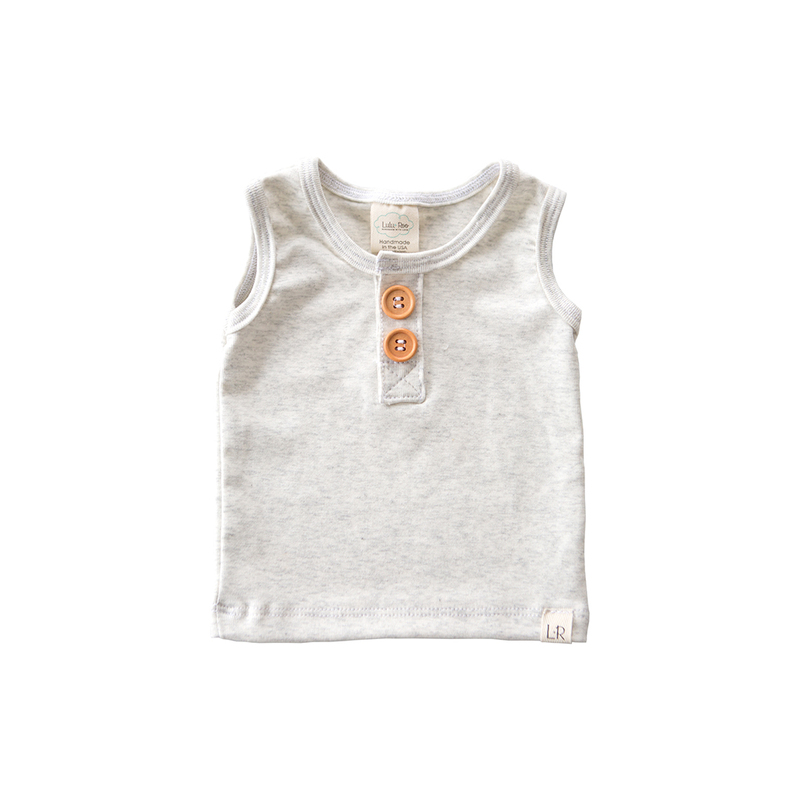 Tubby Todd products are toxin, gluten, paragon, sulfate, artificial fragrance, color, animal cruelty and BPA free. I especially love the lavender and rosemary smell, it keeps my kids smelling so fresh afterward. Utah winter weather gets very dry so we always use moisturizer after bath time, I especially love how moisturizing the 100% natural dream cream is. I love finding products that are all natural that my kids and I both love, these do just that! Now if I could only find some time to take a bath ALONE by myself…. ha ha that never happens who am I kidding??!! The first day of spring is quickly approaching which means Easter is just around the corner! 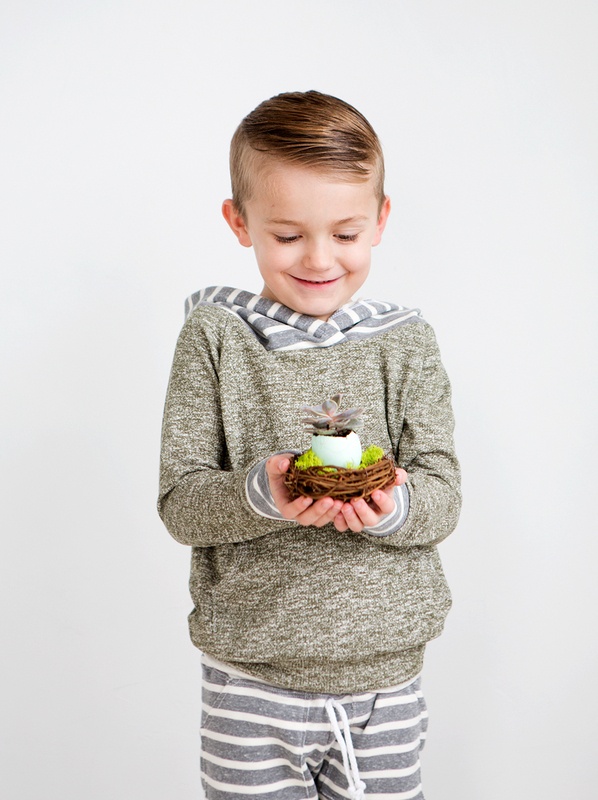 We are kicking off the season with this darling kid friendly easter craft. These little easter nests are so easy to make and turned out SO cute. They are perfect easter decorations or centerpieces, we have another great use for them that we will show you in a future post so stay tuned. Extra large eggs: (We used a mixture of brown and white). Nests: You can get theses at a local craft store, ours are from Michelas and we got a few small and a medium sizes. 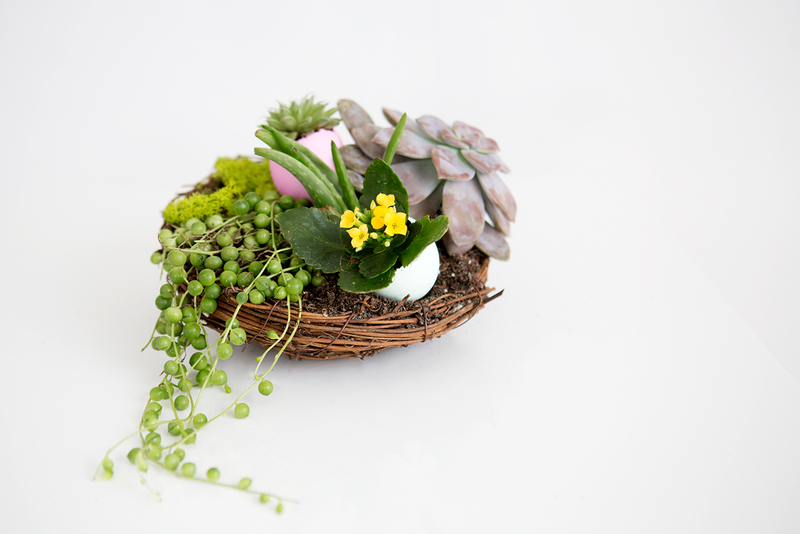 Succulents: You will need small ones that will fit inside the eggs and a few medium size ones to fill in the sides of the nest. We got a veritey of plants we found locally to give good color and texture. Moss: We went with a bright green moss to give the nests a little pop but you could go with any kind or even mix a few together. You can find this at a craft store or at your local nursery. Dirt: We got some Cactus soil that works well for succulents but you could use regular potting soil as well. We also added some plastic eggs that we got at the craft store for more color. First you will have to dye the eggs if you want the shells to have some color, you can do this with any egg coloring kit (try dying the brown eggs and you will get deep muted colors that turn out beautiful). Don’t boil the eggs or else it will be impossible to get the egg out without completely cracking them. Give the eggs at least an hour to dry before cracking them open so the color does not wear/rub off. We carefully cracked the top of the egg just enough to get the yolk out, make sure you rinse and clean out the inside of the eggs well so they don’t end up stinking. Next make sure you let the eggs dry completely before you pop in your succulents. This is also something the older kids can help out with. The shells are delicate so younger kids might end up breaking the shells without handling them extra carefully. There is not much more to it, you just transfer the succulent from the pot to the shell making sure you get all the roots in first so they are at the bottom and then fill in around the top with extra dirt. After your eggs are done you can start making your nests. Just fill the nest with dirt then add an arrangement of other plants. 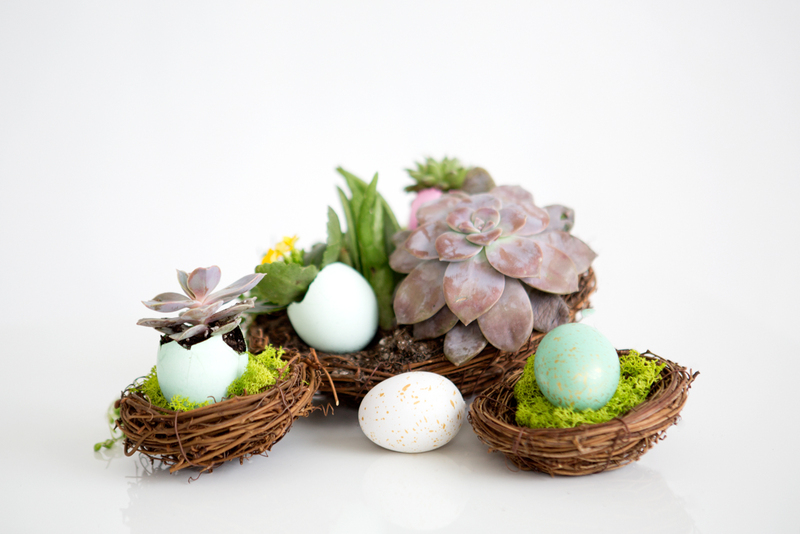 Place moss on the top and add in your succulent eggs with some of the plastic eggs for variation. The kids absolutely loved helping us out with this part. Before you know it you will have beautiful easter nests with just about a million uses, I think I could have one of these in every room of my house! We just love the way this little craft turned out. After trying out this craft weeks ago our succulents are still doing well and look absolutely beautiful. The kids have had a lot of fun taking care of their nests too. Succulents are surprisingly very easy to take care of with little maintenance. They require direct sunlight and only light watering a few times a month. We can’t wait to show you another great use for these little beauties in a future post! Hello everyone! I am Amanda the photographer and creative director for Lulu and Roo and Simply Stitched. Sydni and Jori have been good friends of mine for a long time and I am so thankful and honored they brought me on their team at Lulu and Roo. It is the best job ever and I love being apart of this amazing company that Sydni and Jori have built. I have been a photographer for the past ten years and it is one of my passions. I also love anything artistic and creative. I have a beautiful family with my husband Jordan and two boys Ronin and Archer and one more due in August. We are so excited to be growing our little family. I truly feel blessed to be having my third child. I was pregnant in 2014 and in 2016 but both of those pregnancies turned out to be Blighted Ovums. If you are not familiar with a Blighted Ovum it is basically where a fertilized egg attaches to the uterine wall but a baby doesn’t develop. The first time it happened it was confusing and emotional. I felt pregnant and was having all the symptoms and when we went to our first Dr. appointment they did an ultrasound and found the sac but no baby. They said that it could be an early pregnancy and it might not just be showing yet. They had me do blood work and wait a week to come back to see if a baby had developed yet. That following week was SO HARD with plenty of emotions! We went back for an ultrasound and nothing had changed. I was heartbroken. It was hard for me to want to try again after that. 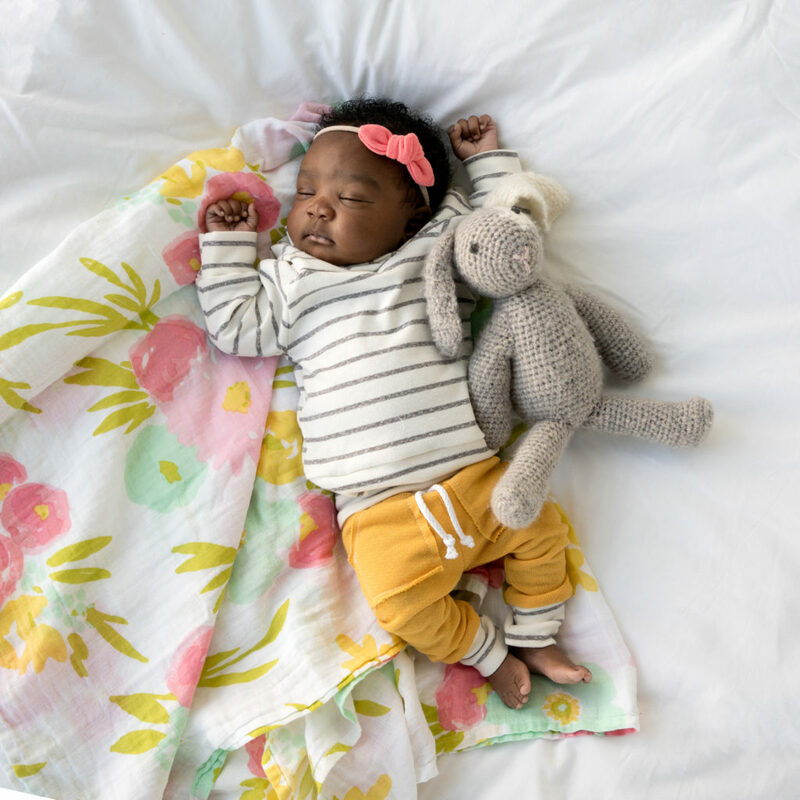 I had a million reasons to put it off even though I knew we wanted to have another baby. I was just too scared. In 2016 I was pregnant again and excited! The Dr. Said it was rare for Blighted Ovums to happen twice and everything I had read and researched made it seem like I was in the clear. We went to our first appointment for an ultrasound and BOOM! Right when I saw the ultrasound screen my heart just sank. I saw the sac and it was empty. I just knew right then there was no baby. The Dr. had me do the same routine as last time just to make sure it wasn’t another early pregnancy. I knew it wasn’t. The following few weeks were pure Hell! My body still thought it was pregnant so I still had all the symptoms and hormones. I felt like I couldn’t heal or move on until I had a D and C a couple weeks later. The first ultrasound for this pregnancy was a little scary because at first all we saw was the sac but this time they were able to see a tiny yolk sac too. There was something there! It was too early to be sure and we had to wait a week for another ultrasound but when we came back we got a heartbeat and I was so relieved! Now we are so excited for our baby GIRL to join us in August! I still can’t believe I am having a baby let alone a girl! I feel so blessed! We decided to do a little gender reveal with my boys to celebrate. 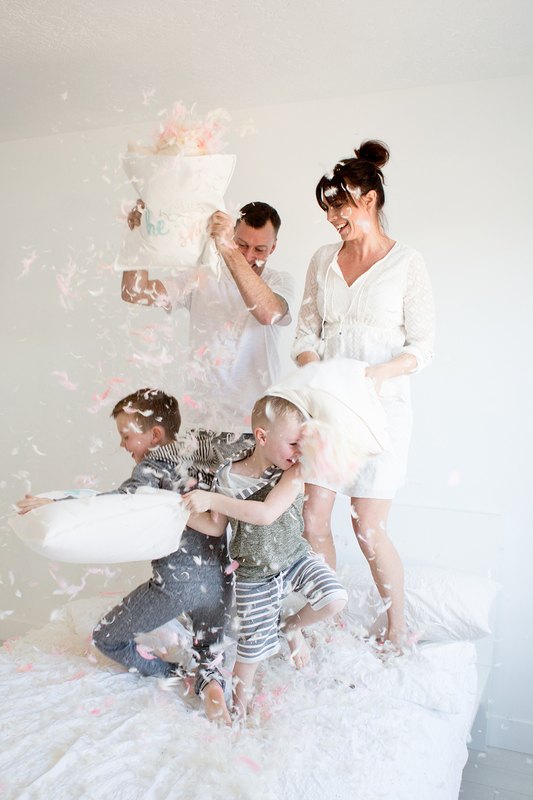 A pillow fight seemed only appropriate for a family of boys. Sydni and Jori helped me pull it all off. We made a cute printable (GET IT FOR FREE HERE!) and printed it off on a iron on sheet that we got at the craft store. Tip: Make sure you read and follow the direction on your iron on transfer carefully. We used pillow cases and covers from Ikea and Sydni and Jori added the color feathers to the inserts. The pillows turned out amazing and it was the perfect way to find out what we were having. We got our ultrasound the day before and we had to wait 24hrs to find out which was a killer! I don’t know how Sydni and Jori kept it a secret! I thought we were for sure having another boy and Jordan wanted a girl so bad. I think we were in shock when we saw the pink feathers fly! 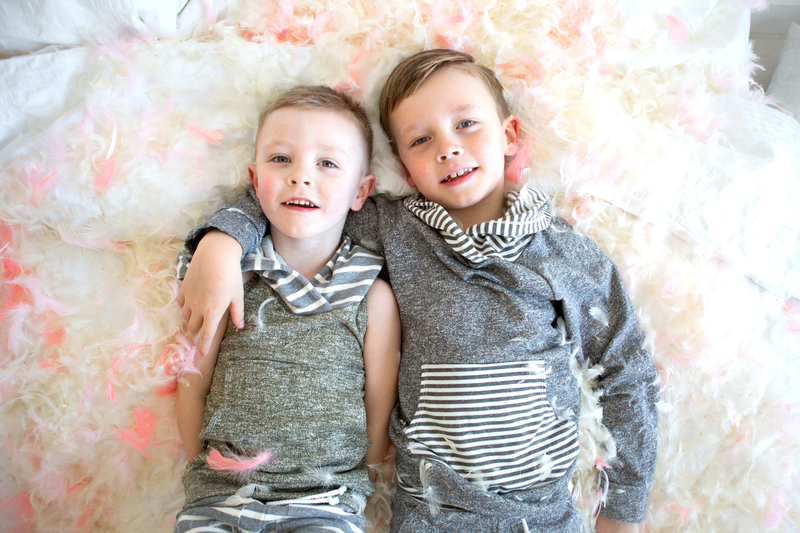 The boys had so much fun pillow fighting and the feathers made for some beautiful photos. 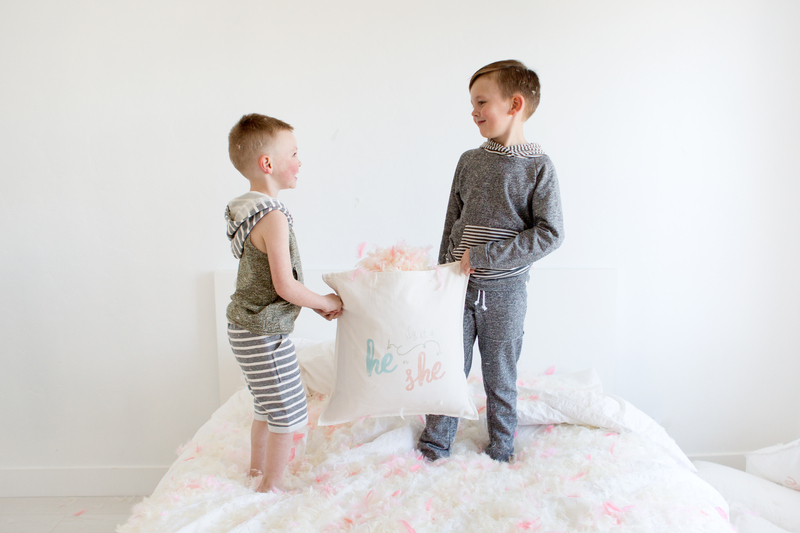 Get The free Printable HERE to make these pillows. Or use the printable for your own gender reveal idea! And don’t forget to share it with us we would love to see your ideas. I don’t know about you but we LOVE celebrating holidays at our house, especially my kids (they get so excited)! 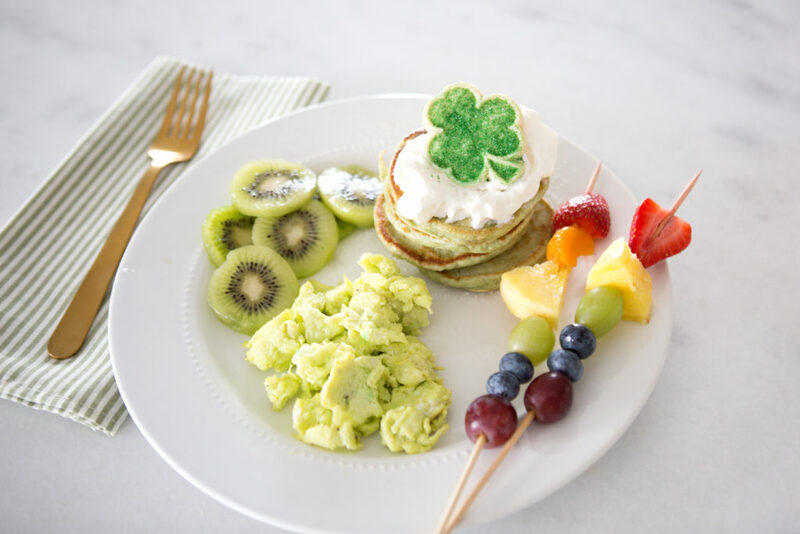 Every year on St Patricks day we have a tradition of doing a St. Patricks day breakfast which is super easy to do and so fun. I typically will make pancakes and scrambled eggs and just color them green with gel food coloring and add in some colorful fruit. I got these adorable cookies just at my local grocery store and topped the pancakes with some whipped cream (simple and easy). I usually serve this with some green milk (naughty leprechaun) and maple syrup drizzled over the top. Usually our leprechaun forgets to flush and leaves behind a mess! Here we used some green colored frosting by stamping our hand in it and pressing it on the toilet (put your hand in a fist and use the pinky side to make it look like a foot). We made the four toes by dipping our finger in frosting and creating four dots above the foot. We hope you enjoyed this fun and festive post, hopefully you gained some inspiration and ideas for St. Patricks Day! As always, leave any questions and input in the comments below. Oh what a few good books can do! As a busy mom having some solid children’s literature on hand is a lifesaver. 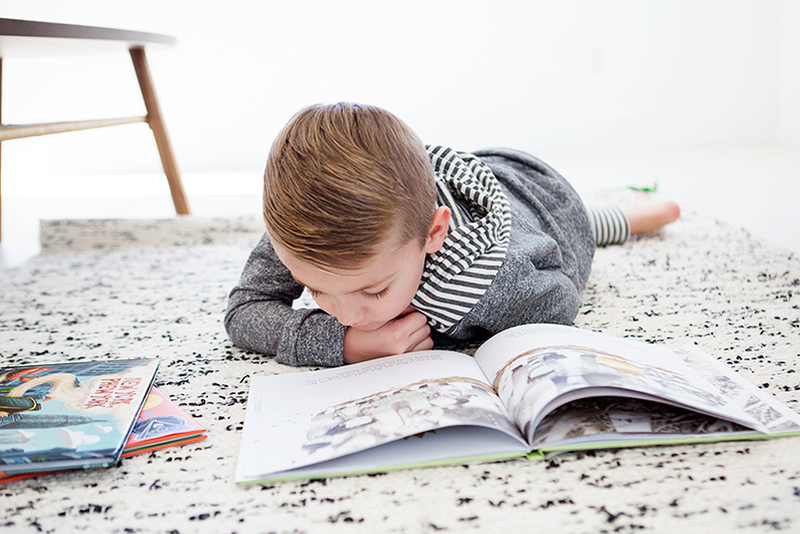 With an arsenal of books you can conquer many mommy dilemmas. Sometimes I pull out favorite books for the kids to look through when I need a few quiet moments to myself or time to finish up a project. Reading to my kid for a few minutes has even defused a few full blown tantrums. Not only are books a useful mommy tool but nothing beats the moments when you read with your kids. Some of my favorite moments during story time are of course the snuggles, little fingers pointing at the images and the excitement on their faces. Now lets get real, sometimes the last thing I want to do is sit and read after a long day of work. I can find a million excuses to put it off and start a load of dishes or laundry instead. That is why finding good books that the kids love has been key to incorporating reading into our daily lives. Introducing new books frequently keeps things exciting for everyone. Here are a few of our current favorites that our kindergartner and first grade kids love that are easy to read yet fun and entertaining. We started a monthly book post to share books that have been winners with our kids. Whether it be a good story, educational, or amazing illustrations our monthly picks have got it all! This book is a tale of a hungry fox who invites a goose to dinner. The funny details in the illustrations will bring nonstop laughter to story time. This is one of my first grader’s favorite books to read before bed, we’ve read it so many times she almost has the whole book memorized! My favorite part is the twist at the end, it’s a book you and your kids will equally love. This book is definitely at the top of my list as far as children’s books go. It’s all about finding beauty in everything around you and appreciating what is right in front of you, something I personally think we all could focus on a little more often. I’m not going to lie, I always choke up at the end of the book it is so heartwarming and the illustrations are incredible. This fun scratch and sniff book is told by a child who is on a family vacation in New York City. It includes all of the smells that you may come across while being in the city. From the good smells of pizza & hot dog’s to the bad smells of the sewer and garbage through out. Seeing my little boy’s face after smelling all of the different scents was priceless, a definite change up from the typical books we read. ” What do you do with an idea” It’s a cute story of a brilliant idea and the child who helps bring it into the world. As the child’s confidence grows so does the idea. This is by far one of my favorite books to read my 5 year old. I want him to grow up with confidence and to not ever be afraid to bring his idea’s to life. It is a must read for kids. We absolutely love it!! Hello! Thank you for visiting us at Simply Stitched blog. 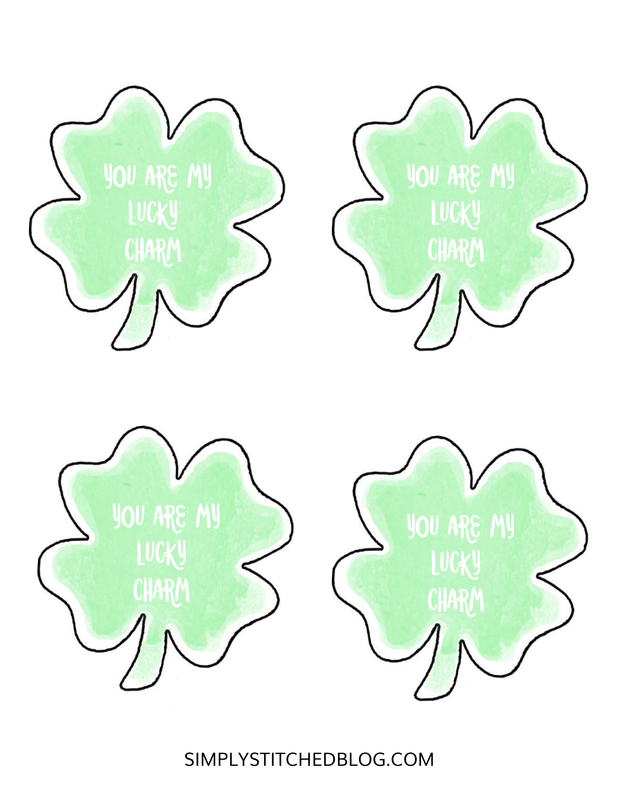 We are beyond excited to be launching this week and wanted to kick things off with a free printable for St. Patrick’s Day. Now you can be the coolest mom ever without breaking a sweat. 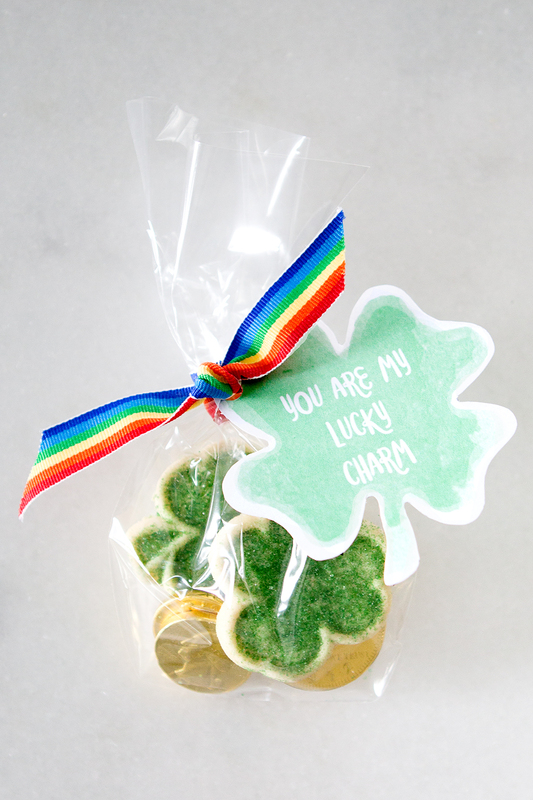 These little treat bags will put a smile on your lucky charms face all day. They are super easy to put together and so cute! 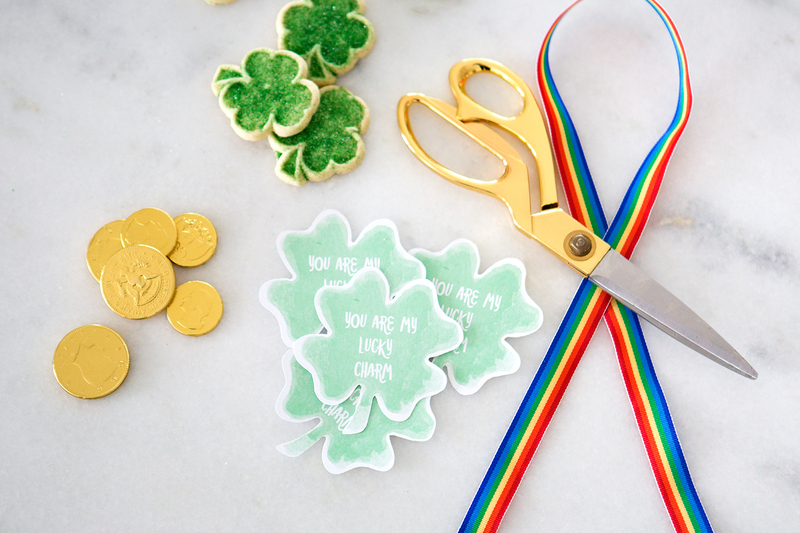 Fill bags with some St. Patricks day treats (we used gold coins and some store bought cookies) add some ribbon, print out our FREE printable HERE , cut out clovers and attach to the bag, annnnd mic drop… your done! Send your treat bags in kids lunches or have it waiting for them for an after school snack. 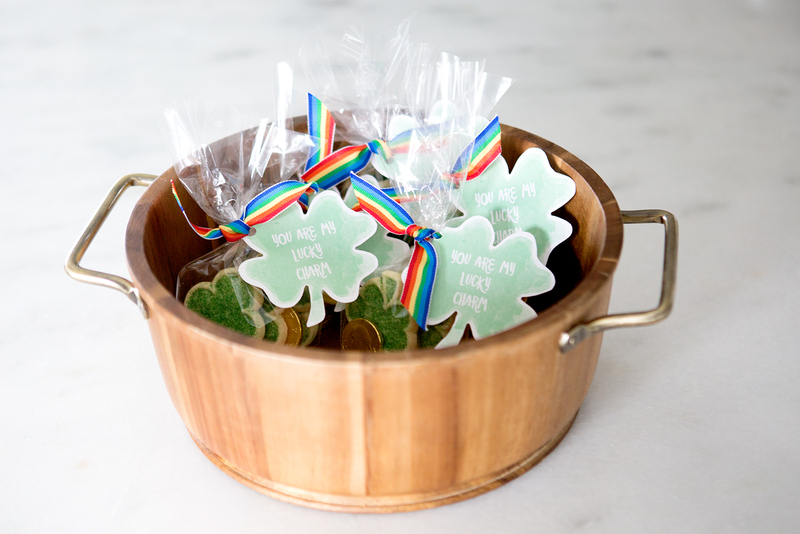 Even though St. Patrick’s day is not a huge holiday for us it is still fun to celebrate with little things your kids will love. The best part is you can make it a memorable day with almost zero effort. GO YOU! Click below to print or download the printable and be sure to share with friends! 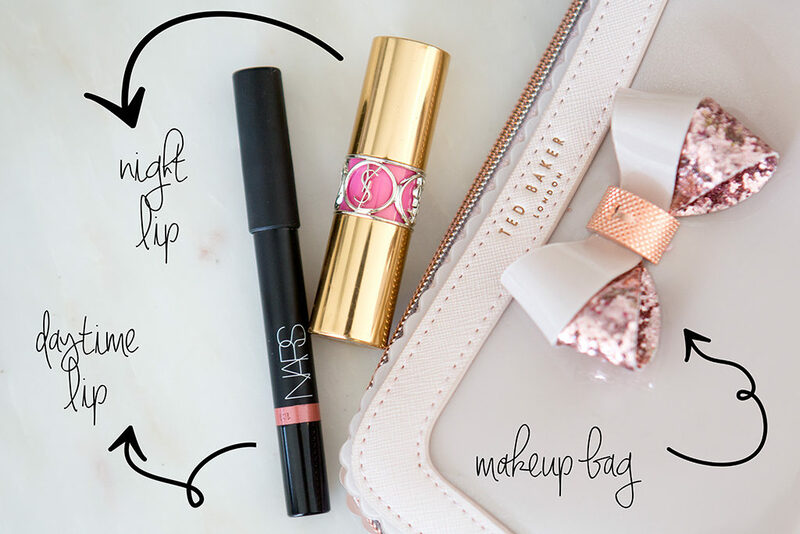 I’m so excited to share some of my favorite makeup items in my bag right now. For me makeup is much needed even if it is a quick 5 minute job in the morning, I rarely leave the house without it, especially now entering my 30’s… EEK! These are some makeup products that I usually use everyday and I feel stay on really well between the craziness of everyday life … not to mention a two year old, need I say more? I don’t have a lot of time in the mornings as I am usually rushing to get my first grader off to school and my 2 year old dressed so I usually spend 5-10 minutes on my makeup tops. It may just be me but I feel that a good make-up bag is essential! 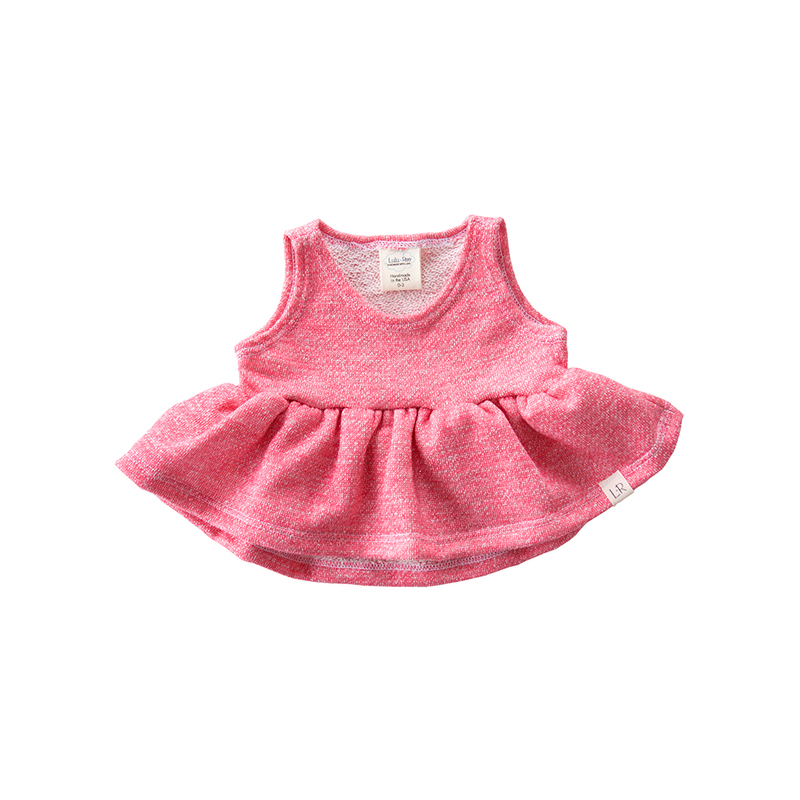 Especially when it’s as cute as this one from Ted Baker. I love how easy both the inside and outside is to clean out because mine always ends up a mess when something gets spilled. With this one I can easily wipe everything down with a makeup wipe when I am on the go without it getting ruined, it’s definitely a must have! A good tip that I learned from a makeup artist is to start with the eyes. I used to always start with my foundation but when you start with your eyes you can easily wipe off any excess product without ruining your foundation. This is a major time saver for me if I do my eye makeup first because it is usually the thing that I mess up first, especially my eyeliner. I love this eyeshadow kit from Tart the colors are very neutral and the shadows are highly pigmented. I feel like they last on my eyes better. Day to day I typically don’t use an eye primer but if it is for night time I defintiely will. I have eyelash extensions so I only use this Lancome mascara on my bottom lashes which is great because this one tube will usually last me a loooong time. I also love this super slim liquid eyeliner from Loreal because the tip is very fine and it seems to last a long time without smudging. –Also I have recently started using Maskcara products which I have loved but have decided to do a separate post about this so stay tuned!! My brows are pretty much nothing if I don’t pencil them in. I have had mine micro bladed which I love but they still need a little help with darkening my very light eyebrows. This kit from Anastasia is my absolute favorite. It comes with two tones of powder, a double sided brush and clear gel to hold everything in place at the end, it really has everything you need. I also love this benefit cosmetics fine pencil because you can easily mimic hair strokes for a more natural look. I very much regret over plucking back in my teenage years (don’t we all) but these two purchases have definitely helped me out. I always use a moisturizer and then a primer after. My face gets very dry, especially in the winter. This primer from Lancome has turned into one of my favorites and helps my foundation stay put all day long. My very favorite foundation is this Lancome tent idol ultra 24. 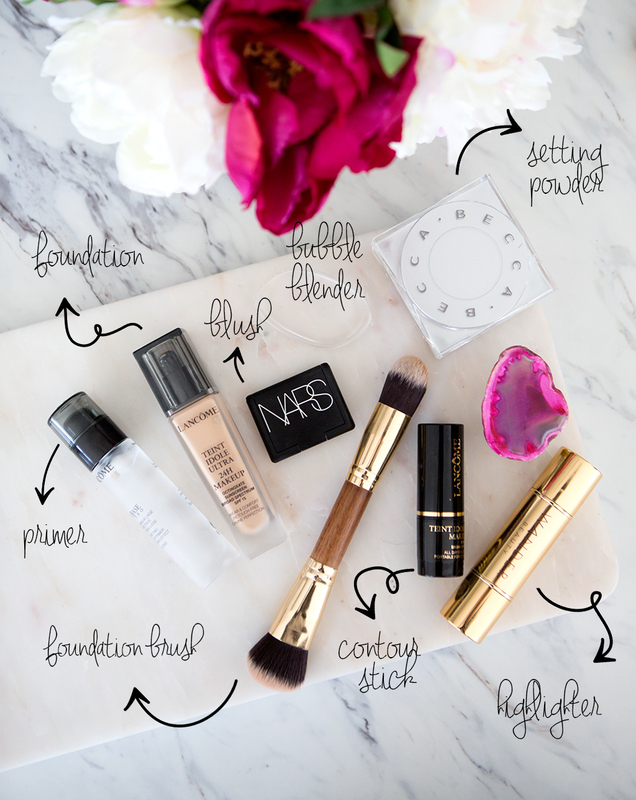 For me nothing has ever come close to this foundation every time I have tried out something new. I have been using it now for a few years and I still love how it goes on my skin and how well it stays put. I apply it after my primer with my silicone bubble blender. I love this bubble blender because it is very easy to clean and sanitary, it also doesn’t waste any product, YAY! I then use my double ended foundation brush from Maskcara to fill everything in on my face and if needed use some under eye concealer. I like to use my contour stick on the outsides of my face, under cheekbones and sides of my nose. I finish with setting powder from Becca. A trick with applying loose powder is to VERY lightly pat your powder with a brush to your skin to set your foundation instead of quickly stroking it all in. This I feel has made a world of difference for me and helped my makeup to stay on longer instead of smearing my foundation. I end with some blush on my cheekbones (I smile while doing this) and a little highlighter above my cheekbones. When i’m in a hurry the highlighter gets skipped and I rarely do this in the daytime, it’s usually just at night. I typically don’t wear much lipstick during the day but I find this Nars stick is the perfect bit of color without being too much for my lips. I love how it moisturizes my lips and how lightweight it is. At night my favorite lip is this saint Laurent. It gives the perfect amount of moisture and shine and I love the way it smells, I haven’t found a lip stick I have liked better. I hope you all like my top tips, are any of these your favorites too? If you have any suggestions I would love to hear them, I am always up for trying new things! Welcome to our blog, we are so excited about this new adventure that has been months in the making! If you don’t already know us, we are Jori and Sydni, owners of a children’s clothing line Lulu and Roo. 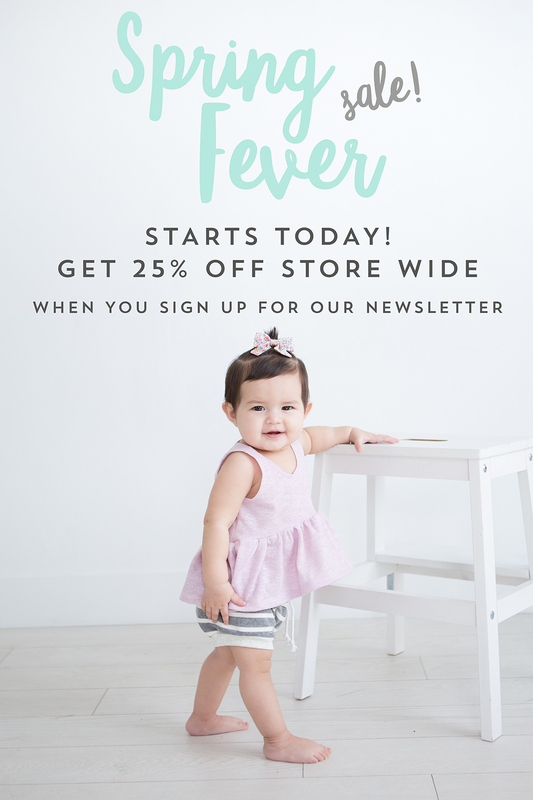 Our brand started out when we were both pregnant with our boys trying to find clothing we liked. 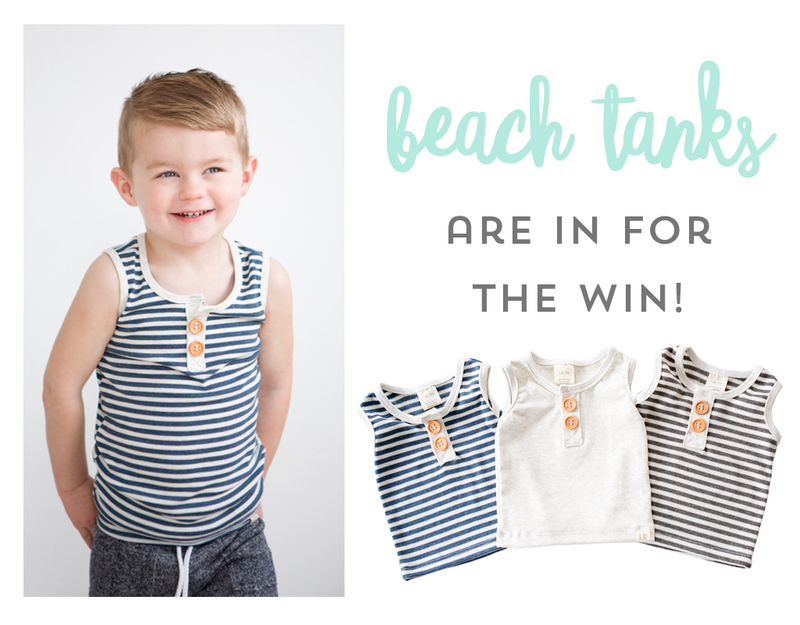 What started off as a few ideas and a couple yards of fabric in an unfinished basement quickly spun into a children’s clothing line. We both feel so fortunate to be on this journey together and want to share some insights along the way. We have a passion for creativity and design as well as a strong desire to try new things, we hope you enjoy it! Looking back on this journey as a business owner it was very much a struggle in the beginning with lots of sleepless nights. Jori and I were juggling newborn babies and second jobs at night. I remember both of us being so tired while rolling fabric out on the floor that we both just sort of just collapsed laughing from exhaustion. We both had been business owners before so we already knew the routine. We had SO much on our plate at the time that it took exhaustion to a whole other level! Starting our business was full of the best and worst memories but we wouldn’t change any of it. We feel so lucky to have one another because our personalities really mesh well. We can remain partners in super stressful situations yet laugh uncontrollably until we’re blue in the face! We have learned to stay light hearted, focused and put what is most important first. Hi loves, I’m Jori. Mom to two little boys Milo & Knox and wife to an amazing husband Ronnie. Just a few things that I have a slight obsession with – music, fashion, design & decor. Oh, and coffee. One of my favorite things to do in my down time is cuddling on the couch with my boys for movie night or taking long drives up the canyon. My little boys are my biggest inspiration and my husband is by far my biggest supporter. He has been there through all of the ups as well as the downs and has always believed in me. Even when it comes to the crazy ideas of starting my own business. When we first started our company he would spend his days off work doing anything from cutting fabric to daily dump trips for us. Needless to say that many thanks goes to him for me being where I am at today. There is a question I get asked a lot ” How do you do it?” Referring to running a business and being a mom. The truth is I just have to give my best effort to both and know that I am trying my best every day. Yes, there are days where I feel like I am failing at one or the other or both at the same time. I have come to the conclusion there is no happy medium or balance between the two of them. You just have to know that you gave it your best that day and that’s ok. I am a big believer in what doesn’t kill you makes you stronger and I do believe that the obstacles I have had to overcome throughout my life have only made me stronger and have pushed me to work harder. My boy’s are by far my biggest inspiration. My son Milo was born with a very rare congenital defect – Arterial Anomaly. Which has lead us to an insane amount of doctor visits, hospital stays, years of injections and much more. I’ll be sure to tell you more about that in a later post. Bottom line is – if you keep pushing and believe in yourself you can keep creating, keep adventuring and moving forward. I am super excited to start this blog and share snippets of my life, business and family with you. Hey everyone I’m Sydni. Mom to a girl and boy (Ella and Liam) and wife to my husband Jarrett. One thing that I love is being a mom, my world revolves around my kids! Being a business owner I do have to juggle my time because life gets SO incredibly crazy but I wouldn’t change a thing. My best memories are spent at home with my family just hanging out. We love cuddling up and watching movies together or playing games. I absolutely love that I get to do what I love each day and come home to these sweet faces, I feel so fortunate. I get a lot of people that ask me about business ownership and balance and how I manage both. I sort of just hate the word balance because I feel like I am far from any type of balance. Some days I feel like everything is going great and the next day it is completely opposite and I’m a mess. I’m the kind of person that always needs a project or something to look forward to so if everything is going just perfect it’s a little mundane for me and I need something else to get excited for. I’m definitely an all or nothing type of person, my house is either completely clean and organized or else it is a complete mess so I’m definitely working on the balance issue.. haha. Sometimes I have the energy to come home and make a huge dinner and sometimes I will be ordering pizza. 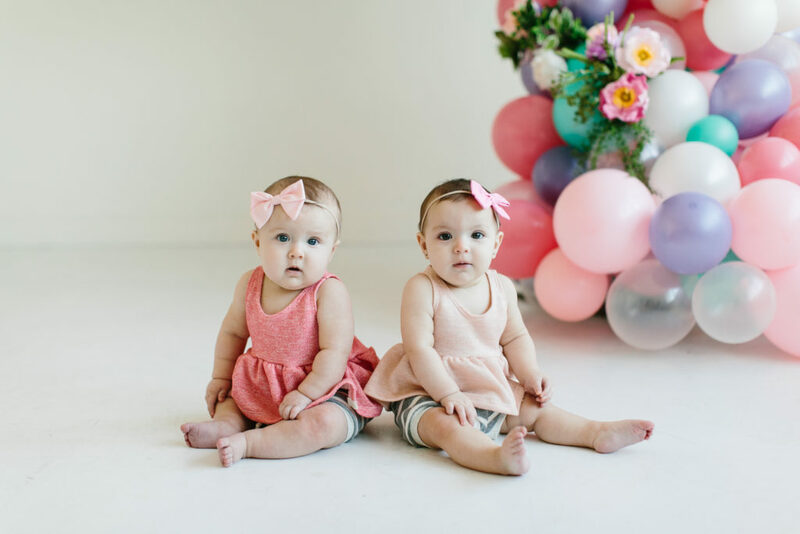 Creating this blog I am excited to share a little bit of what we all need as mothers including advice, inspiration and of course some fun how to’s. My husband also owns his business and I feel like it is somewhat easier on our marriage. We both understand that we don’t have 9-5 jobs and we are always on the clock. Before I was a business owner I didn’t quite understand all the issues he constantly came to me about but now I feel like I’m coming to him with the same issues, haha it’s kind of funny. I absolutely love everyone I work with right now, I think we work very well together. We are so lucky to have a great team with Lulu and Roo, we definitely could not do it without everyone growing with us on this journey.